A pentomino is a plane geometric figure formed by joining five equal squares edge to edge and there are 12 of them. People have been making pentomino puzzles for over 100 years! 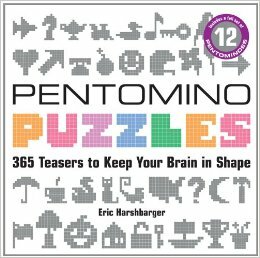 The book contains all of the 12 pentominoes and 365 pentomino puzzles with solutions. Writer: Eric Harshbarger. Size: 22,8 cm x 20,7 cm x 3 cm.